The U.S. Federal Aviation Administration (F.A.A.) is providing specific details regarding a Talofa Airways incident at Pago Pago International Airport after Senator Magalei Logovi’i voiced concerns about the slow emergency response from the Airport’s rescue crew. Responding to Samoa News inquiries, F.A.A. spokesman Ian Gregor explained that the Talofa Airways plane landed without incident around 8:30 a.m. on Friday on Runway 5. “While the plane was taxiing, the landing gear collapsed,” Gregor said from Los Angeles. He said there were eight passengers on board and nobody was injured. Gregor also said that the Airline reported the incident to the F.A.A. 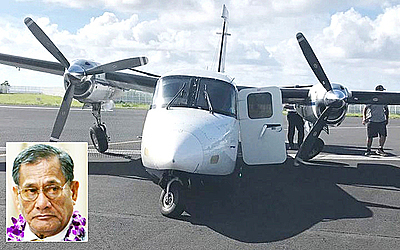 Magalei, who was among the passengers on the flight, told Samoa News on Thursday afternoon that he was very concerned with the slow emergency response from the Airport rescue crew, who didn’t show up until later. A committee hearing has been called for Thursday, Jan. 18, and Port Administration director Taimalelagi Dr. Claire Poumele, will be among witnesses asked to testify. In the meantime, Magalei was among the passengers on the Talofa Airways flight from Fagalii Airport. He explained in a Samoa News phone interview that when the plane landed, a section of one of the tyre areas broke, as the plane turned. He credited the pilot for being calm and quickly shutting down the aircraft to prevent any serious matters. “We waited inside the plane for 10 minutes,” he said, and during that time, Magalei said he used his cellular phone to contact emergency services, including Airport management, but he didn't get any satisfactory replies. He said a vehicle stopped by on the runway, to check on the plane, and the passengers were able to get off the runway. Magalei said he was told by airport personnel that the director, Taimalelagi Dr. Claire Poumele, was at a Fono hearing. Magalei said it was later, when the passengers were already off the runway, that fire trucks from the Airport Rescue crew showed up and sprayed foam on the runway spot where the plane was sitting. “My point is, if the plane had broken down and burned, where was the rescue crew? No one showed up right away when this incident occurred,” he told Samoa News, adding that he was very upset with the sluggish emergency response time. Magalei said he plans to call a committee hearing for next week, to summon Taimalelagi and other airport officials to answer questions. The senator also questioned as to whether the airport has filed a report of the incident with the Federal Aviation Administration.